Islander Hula 8.5 sit on kayak with paddle. Good condition, few scrapes on bottom, nothing serious. Condition is Used.Two seater Kiwi Perception Kayak with bucket seats (and cup holders). Plenty of room for two adults plus a child/dog. Seats on runners so easily adjustable for single person use. Ideal for touring/camping. RTM Mojito sit on kayak with paddle. It may look small in photo but it's not. Size of Kayak is 2.5m long, 0.8m wide and 0.4m deep. CE Approved - Heavy Duty PVC - Choice of 4 Colours!!!!! A very good river touring Kayak but also can be used on whitewater. It has a waterproof bulkhead so small camping things can be stowed there for overnight camping, tarp, food stove, sleeping bag etc. Perception Sierra Kayak and OrigiNZ Zambezi paddle. Single seat. Condition is Used with the usual scuffing to the underside and sides from launches. It has a comparatively comfy padded/moulded seat and adjustable foot rests. Intex part number 68307. 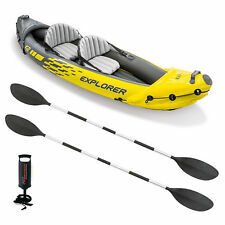 INTEX EXPLORER K2 KAYAK. Supplied with high output pump and oars. 2 PERSON INFLATABLE KAYAK. Rugged vinyl constructions, grab lines on both sides, inflatable floor for comfort and rigidity. Condition is Used. Normal scratches on bottom. Intex part number 68305. INTEX CHALLENGER K1 KAYAK. Supplied with high output pump and oars. 1 PERSON INFLATABLE KAYAK. Rugged vinyl constructions, grab lines on both sides, cargo net for extra storage. The Venture Easky is about as large as I like to go on a river but is ideal for sea and estuary work. Thighbraces were designed by Pyranha and are adjustable and quite comfortable. Adjustable footrests allow for different heights of paddlers. Pyranha Fusion Kayak - Small River Tour model. Item is located in Pembrokeshire. Collection only. Photos show actual item for sale. Sevylor - Tahiti. The family version of the Tahiti is longer to fit an extra seat and convert the kayak to a 2 adult and 1 child family kayak. After deflating the kayak roll it into the spray deck. Avoid the hassle of a tight fit carry bag and enjoy the incredible portability. Fishing Kayak, Rod Holders, Seat and Paddle. The kayak is in good condition. This is a purpose designed fishing kayak with 5 Rod Holders. It is a very stable platform to fish from. It has 2 Storage hatches for storing bait or lunch. The seat is faded from the sun, but is in good working condition (And is not expensive to replace if looks are important). The paddle splits in 2 for easy transportation. Pyranha Inazone 232 Kayak with paddle and accessories. Kayak in great hardly used condition with only slight superficial scratching Will come complete with brand new S/M Yak spraydeck, adjustable paddle and brand new pyranha foam bulkhead footrest ready to cut to sixe for the new owner. Will also supply original adjustable footrests and hardware. Only selling due to kayak being too small for so I’ve never got around to using it. Collection only from CF39. It has no footrests as on a playboat we normally make up our own with foam blocks. Length is only 210cm at most. In my mind will make a cheap kayak to get into playboating. Needs a new bung which should be about £6 from a prijon dealer. Ocean Kayak- Malibu Two sit on Kayak with seats and paddles very good condition! Condition is Used. The kayak will comfortably take two adults but will also take a third small child in the middle. The sale includes two comfy (adjustable) adjustable seats and also two paddles. It is very stable and easy to paddle and is good in all conditions, used a lot in the sea and copes admirably. One Person Sit On Kayak - 285 X-T-SEA With Paddle. Condition is Used. Back support Very good condition Please call 07903710008 to arrange viewing. 6 x kayak rubber bungs (scupper stoppers/drainhole plugs). 2 piece lightweight paddle. 1 set of Transportation Wheels. Padded backrest seat. Intex part number 68306. INTEX CHALLENGER K2 KAYAK. Supplied with high output pump and oars. 2 PERSON INFLATABLE KAYAK. Two Inflatable seats with backrests. Rugged vinyl constructions, grab lines on both sides, cargo net for extra storage. Kayak with Spray Deck, Paddle & Gul Bouyancy Aid. All in good condition. Was going to use it to go fishing with but unfortunately just don't have enough time. It was great for exploring around creeks of Essex. I can't remember the make of the kayak but it is similar to Kiber Kayak's that I have seen on ebay. Any questions please Email. GALAXY KAYAKS OUTRIGGERS STABILIZERS. Length of outrigger 92cms. Convert your kayak into a steady, stable platform with a pair of outriggers suitable for any GALAXY KAYAK plus any sit on top but you may have to make sure you can fix them in place. For sale is my Dagger Blackwater 10.5 touring kayak. The Dagger Blackwater 10.5 is a safe and stable kayak. The kayak weighs 22 kgs and has carry handles at bow and stern. Ideal for children or small adult. Paddle included. 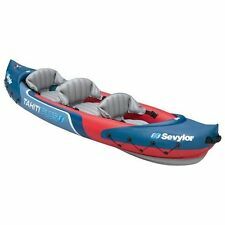 1 Man Inflatable Canoe Kayak with Oars and Pump. Challenger K1 One Person Kayak set is made from Intex "Super-Tough" vinyl which is a high molecular PVC that is unaffected by gasoline, oil and salt water. Ocean Kayak Prowler 4.1 Elite Fishing Kayak Canoe in Red. Excellent condition with hardly any marks. Comes with Humminbird Fish Finder. An expensive accessory on its own. Robson paddle. Seat Rod holders. Can deliver locally. Trailer NOT included in this sale. It is available in a separate listing though. CONWY KAYAK. The storage holds have been updated this year with a sturdier locking system ensuring improved watertight protection for your belongings. One single seater Conwy kayak. Our kayak is a fantastic way to get out on the water. Folding Kayak Condition is Used. An extra set of air sponsons so you can run it as a Quattro. SEAFLO SF-1002 is a playful kayak specifically designed for kids. Polyethylene blow molding production process, it is maneuverability and forgiving, with great secondary stability. This little kayak is responsive and stable, good for lakes, ocean bay and slow rivers. Kayak includes two flush rod-holders and comfort seat. Included in sale are trolley and paddle. FREE JUNIOR PADDLE & FREE BACK REST. Kayaking is a brilliantly inclusive water sport. It can be a relaxing and affordable way to enjoy being out on the water. Of course, there are the serious kayakers who take to the roughest rivers or compete in racing events, but if you just fancy splashing around in your local lake, there's nothing to stop you giving it a try! Make sure you include all the appropriate safety gear like life jackets and get lessons from a professional instructor to get you started if you are unsure of the basics. The beauty of kayaking is its versatility. Basically, wherever there's water, you can kayak. Many models are specifically designed for a certain kind of water or activity though. For example, a sea kayak will have a more pointed, slim bow and stern to cut through the waves and a semi-flat hull for stability. For the best manoeuvrability, choose shorter boats. For more stability or to fit two kayakers in one vessel, look out for longer boats. Sit on top kayaks are popular with children and beginners. Some novices can find the idea of having to exit a sit-in kayak in the event of a roll intimidating, so a sit on top model is a comforting choice. Not only that, they are lightweight and easy to transport. Choose a colourful model if you are purchasing one for children. If you plan to tour in your kayak, look to the touring models with their rugged design, comfortable seats and gear storage facilities. You'll be in your boat for a while, so it pays to invest in comfort and convenience. Choose a kayak with the right features if you fancy using it for fishing trips. You'll find specialised fishing kayaks with fitted rod holders and paddle parks to stop your paddles floating away while you fish.